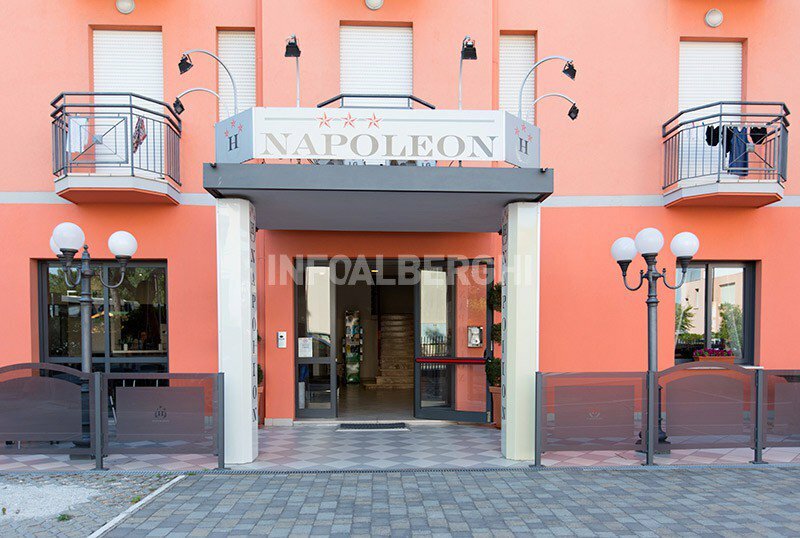 Hotel Napoleon is a family-run 3 star hotel in San Mauro Mare. It is just a few minutes walk from the beach, has free parking, a garden and facilities for children. Accept small and medium-sized animals. The hotel is less than a 5-minute walk from San Mauro Mare beach. It is about 5 minutes drive from the Romagna Shopping Valley shopping center and is not far from the bus stops, with which you can reach Bellaria and Cesenatico in about 10 minutes. All rooms have balconies, free WI-FI, air conditioning, safe, digital terrestrial TV, telephone and bathroom with hairdryer and shower. Garden with playground area for children, terrace, free bicycles, large hall with TV area and relax, bar, lift, theme nights. BREAKFAST: international buffet breakfast with sweet and savory meals. LUNCH AND DINNER: choice of 3 menus prepared according to the local tradition with buffet of appetizers and vegetables and dishes of meat and fish. Pasta and desserts are homemade. In the hotel: outdoor playground area in the garden, strollers, entertainment. Paid pediatrician available. On the beach: live entertainment, playground, baby / mini club. The hotel has an agreement with the bathing establishment "Bagno Delio" of San Mauro Mare, a few minutes walk from the hotel, with cabins and hot showers, ping-pong, table football, bocce and beach volleyball courts and a playground for children. The price list for stays of at least 3 days per person per day. TOURIST TAX: excluded. Applies from June 15th to August 31st the amount is € 1.50 per day, for a maximum of 5 days (maximum per person € 7.50) all minors are excluded. ALL INCLUSIVE min 7 days: Water and Wine with meals + Beach Service (umbrella and lounge chair). - Meals that are not consumed will not be deducted from the full board rate. - Upon request a boxed meal can replace the meals that would be missed.